This museum was established in 1924 in the Convento di San Bernardino at Santa Maria degli Angeli to house art removed from the church. Opening hours etc are published on the website of Musei Ecclesiastici Umbri. The main exhibits are set out in five rooms devoted to the history of the complex. It is also possible to visit the rest of the convent on request. This crucifix, which bears the signature of Giunta Pisano ([IUN]TA PISANUS [CAP]ITINI) in a plaque at the foot of the Cross, was found in a cupboard in Santa Maria degli Angeli in the 18th century, and was subsequently placesd in the Cappella delle Reliquie. It seems to be too large to have been painted for the Portiuncula, and its original location is unknown. It depicts the dying Christ in agony (Christus patiens), an iconography that was already established in Byzantine art but was new to Italy. The image in tempera on this wooden panel seems to be a copy of a figure of the saint in a fresco (ca. 1280) in the lower church of San Francesco that is attributed to Cimabue. It may have been the lid of the first coffin in which the relics of St Francis were preserved, and it is therefore often considered to be a precious relic. These columns made from pink and white stone probably came from the choir that the friars built behind the apse of the Portiuncula in 1485. These detached frescoes were painted on the curved exterior wall of the apse of the Portiuncula. Like the Crucifixion that remains in situ there, they are attributed to Perugino (or to his workshop). They were plastered over in the 16th century and re-discovered in the early 19th century. The artist Antonio Castelletti is documented as restoring the frescoes of the “Cappella dell’ Annunziata” in 1828, and this seems to have involved the effective repainting of these frescoes. They were detached in 1975. 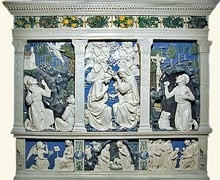 Anastasia Baglioni Sforza, the wife of Braccio III Baglioni, commissioned this glazed terracotta panel from Andrea della Robbia for the chapel near the Portiuncula that Braccio II Baglioni had built in 1458. It was moved to Santa Maria degli Angeli when Baglioni's chapel was demolished and was until recently on the altar in the crypt. ✴the penitent St Jerome (to the right). This detached fresco, which is attributed to Pierantonio Mezzastris, was detached in 1925 from a room in the novitiate of the convent. These panels depicting flying angels were intended to hold candles, probably to the sides of a venerated image. They were first documented in the Cappella delle Reliquie in 1872, when they were to the sides of the Crucifix by Giunta Pisano (see above). They are usually attributed to Lattanzio di Nicolò, and some scholars detect the input of his father, Nicolò di Liberatore, l’ Alunno. This stone figure was originally in the tabernacle of the façade of the Portiuncula that was destroyed in the earthquake of 1832. The recent restoration has brought to light fragments of the original polychromy. This fresco, which is attributed to Tiberio d' Assisi and dated by inscription, is at the end of the corridor to the convent.